This is a fun skill game in which you will be in charge of trapping the zombies. They keep building weird structures and you will have to take them down and make them fall on the safe zone. If the zombie sits there for a while he will get trapped in one of your cages. You will be able to remove the wooden blocks from the buildings and you must do it in such a way that it makes the zombie land where you want him to. Do this in as few clicks as possible and your efforts will be graded with one, two or even three stars if you nailed it perfectly. 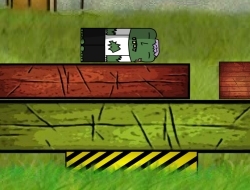 Trap The Zombie 0.00 between 0 and 10 based on 0 votes.